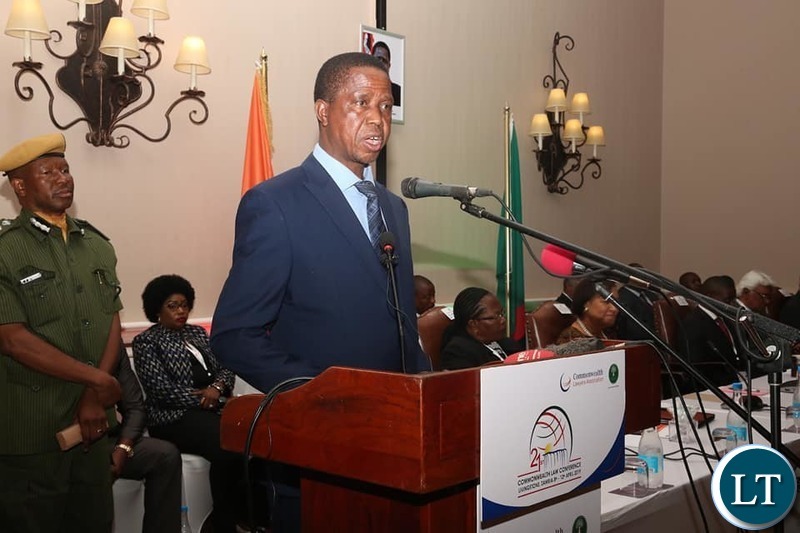 President Edgar Lungu has urged lawyers to be the watch dogs that ensures that the rule of law thrives. President Lungu said lawyers must keep in check the executive, judicial and legislative arms of governance in an effort to ensure all are alert and adhere to the tenets of the law. President Lungu was speaking on Tuesday when he officially opened this year’s Commonwealth Law Conference in Livingstone. He said Zambia is indeed honoured to have won the bid to host the prestigious conference. Let us work together as we continue reforming our laws for the better. It’s a promise my Government is committed to keep. “Our legal fraternity has indeed placed Zambia where it must be in the Commonwealth community of nations and beyond. We shall always endeavor to be a Country of laws,” President Lungu wrote on Facebook. “As I officiated at the 21st Commonwealth Law Conference in our beautiful tourist capital, Livingstone under the theme “The rule of law in retreat? Challenges for the modern Commonwealth”, I did so with a lot of pride that our visitors will help tell a story of the Zambia they experienced,” he wrote. “As a Latin maxim goes: “Fiat justitia ruat caelum” which means, “Let justice be done though the heavens fall”, I urge practitioners to take up the mantle, to be the watch dog that ensures that the rule of law thrives. They must keep in check the executive, judicial and legislative arms of governance in an effort to ensure all are alert and adhere to the tenets of the law,” he prodded. Says the ex lawyer who stolen from his clients. Thieves get along with thieves. Just in 2 years, hold on just 2 years, you will face Attorney General Linda Kasonde and her counterpart the Director of Public Prosecutions (DPP) Martha Musipe, you speak Latin. luat Cuelum means you will followed to Eswatini or Heaven!! There will be no nolle prosecu!! This moron is flying all over the place so he was in Livingstone on Tuesday….he can not even congratulate Linda. “Lawyers must keep in check the executive, judicial and legislative arms of governance in an effort to ensure all are alert and adhere to the tenets of the law” . Linda Kaswende is a cheap UPND cadre. And you’re a cheap shallow minded human. All UPND this UPND that.. what about PF this PF that? Mr Kudos what never your name is. You’re a danger to our beloved country. May you live to see your wrongs. If stupid!ty is contagious, then mr kudos acquired it from Lungu. Please write in English. You can’t even spell a local Zambian name. I hear a gecko stole your brains and stuffed its own into your skull. The clown who exists in his own universe cheered by a brainless horde. smh. He is just running away from his Chawama wife Ester…how many days has he slept at home in the last 20 days. I had to remember this is not April’s fools day. Lungu is a corrupt theif. He does not even deny this. All his orders to PF thugs to observe a cease fire are now clear to see why….. There was a gathering of world lawyers in Livingstone he did not want. He did not want them to see the PF violence. I had to remember this is not April’s fo.ols day. The man looks lost in this crowd of the learned,he is more at home when dancing with Sikazwe….. Yet he is shielding a minister facing corruption charges.. if let him attend court cases and cabinet meetings as if there are no people. Says this Charlatan, sorry excuse of a President, Jona Chagwa, who embezzled a Widows cash. Jona surrounds himself with crooked, blood thirsty semi illiterate thugs like Chimpyongo, Kaizer, & Grade 7 -Davies Mwila. This cabal has no capacity to lecture peace loving, law abiding Zambians about upholding the rule of law, as they wouldn’t know law, even if it slapped them in the face!! Those qualified, like the Sesheke Cops, who made a good attempt @ upholding the rule of law were, hounded, persecuted, & dismissed, by this same Cabal led by Jona Chakolwa Chagwa. Ba Jona, if you have nothing tangible to say, keep the rubbish from your alcohol soaked brain to yourself! And when they are you call for their blood and heads. This is the problem of reading speech written for you, even when you sure don’t give a sh!t, you just read it. The man stole K3 6000 from a woman as a lawyer. What can he teach the honest learned lawyers who have practiced with integrity? He lost licence as a result shame!! Remember up to now Kawalala Chakolwa Chagwa, has not adhered to the Con Court ruling for all money wrongly paid to his Cadre P.F officials after Parliament was dissolved, should be paid back A.S.A.P into Government coffers. Yet this ex Kachasu drinker Jona is giving advice on how to uphold the law in Zambia?? And this is a government that has gone against the rule of law more than any other government in the history of this country. Today they are very powerful as they control everything in the country but time is ticking. One day they will pay for their misdeeds, no matter how long it takes. Please appoint Prof Kenneth K Mwenda to your cabinet he is one of the top 25 academics to come out of Africa and he is Zambian. We need his brains to sort out Zambias legal mess. Just READING comments from UPND STOOGES,full of bitterness and HATRED. As people like……spaka spend 24 hours displaying their BITTERNESS and HATRED for ECL and PF.Your psychology is very clear as SNOW.Its like you have been given a mandate to manning LT. Even if Ayatollah can be given chances now to rule this country ,bitterness and hatred can go to the peak for UPND. The background paper is SEEN EVERY DAY for HH\UPND and Anglo American.Sad that only 0.01 percent Zambians knows that BUT GOD almighty can’t allow majority Zambians to suffer anymore especially in the hands of HH and his imperialists. Yet lawyers are the biggest criminals who miseuse legal knowledge for their own benefit. there are many documented cases where layer took advantage of client. The government must serious regulate these thugs in robs.